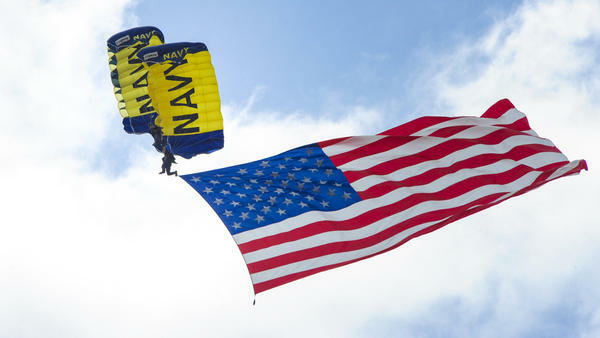 Members of the Navy precision parachute team, the Leap Frogs, fly the American flag. The team is based in San Diego. of military might just 20 miles from the beaches of Waikiki. On the opposite side of Oahu, the Kaneohe Bay Air Show will delight the crowds Oct. 17-18. Admission to the spectacle at Marine Corps Base Hawaii is free. The stellar lineup centers around the U.S. Navy’s Blue Angels but also includes the Navy’s precision parachute team, the Leap Frogs, and the Marine Air-Ground Task Force. Civilian stunt pilots will take to the air as well. One of them, Jacquie B, didn’t begin her career in aerobatics until she was 50 years old. Gates open both days at 9 a.m. While admission is free, grandstand seating can be purchased in advance or at the gate. The air show also will feature food booths and a carnival midway.